Using BizInt Smart Charts for Drug Pipelines, you can create pipeline reports from R&D Insight and clinical trials reports from Clinical Trials Insight. Note: You are limited to exporting 500 records per export and chemical structures can be exported. Log in to the Adis Insight system. Conduct your search, selecting the records you want to export, and click the “Chart” button, as pictured. You will be presented with the "Charting Options" screen. 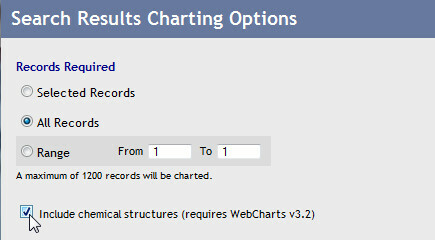 Select “All Records” and “Include chemical structures” to export all records with chemical structure images. Click the CONTINUE button. If you have BizInt WebCharts for Adis Insight installed on your computer, that program may be launched rather than BizInt Smart Charts for Drug Pipelines. Save the new chart in BizInt Web Charts, and open this .WCT file in BizInt Smart Charts.